Despite holding a title that evokes chants and die-ins, Isaí Ambrosio — UC Santa Cruz’s new activist-in-residence — describes himself as a shy guy. Since January, he’s taken on the monumental task of bridging the gap between UC Santa Cruz and the larger city community. 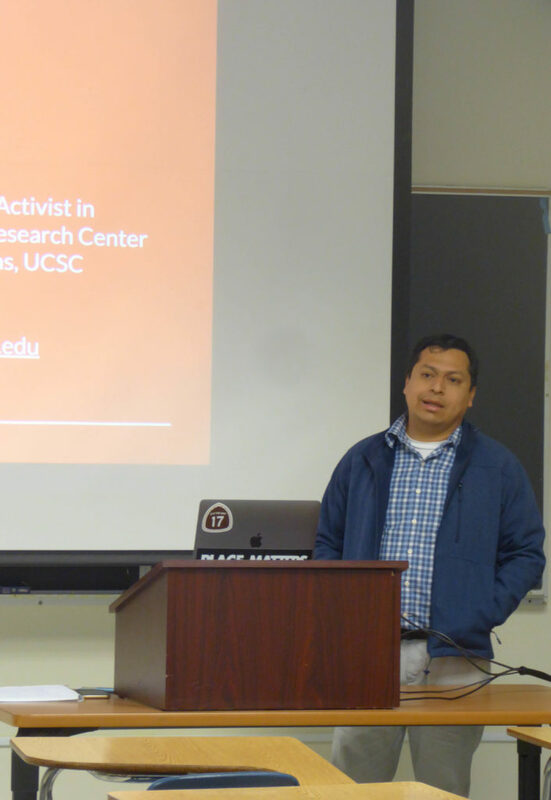 Named the university’s inaugural “activist- in-residence,” Ambrosio acts as an ambassador between the students of UCSC and Santa Cruz County’s various community centers, food banks and workshop organizations. Classroom visits are part of the job. Over the past eight weeks, Ambrosio has had hundreds of one-on-one meetings with students, and made six appearances as a guest lecturer. 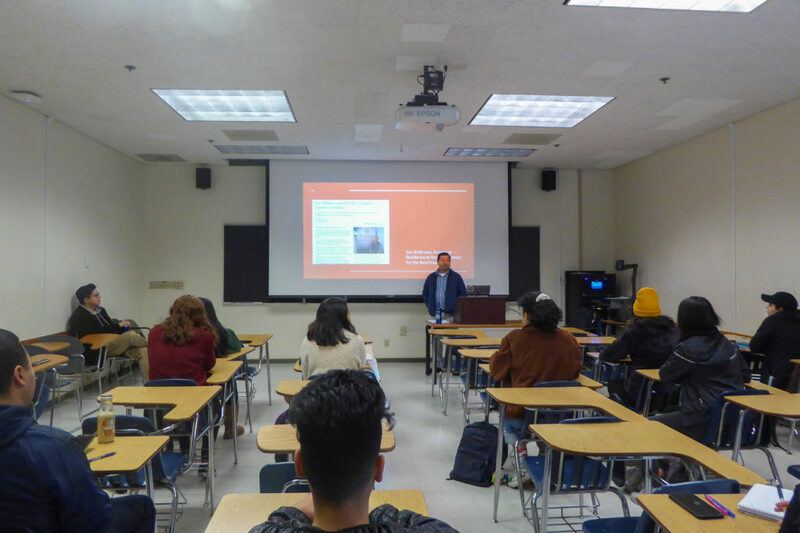 Last Friday, Professor Juan Pedroza hosted Ambrosio in his U.S. Latinx Identities class. Professor Sylvanna M. Falcón, director of the Resource Center for the Americas (RCA), created the activist- in-residence position last quarter. A research institute that studies the movements, culture and politics of Latin Americans, the RCA was looking for a way to link its scholarship with local concerns. Ambrosio fit the bill. Separate from the residency, he’s also the program director of the Davenport Resource Service Center (DRSC), one of six social programs run by the Community Action Board of Santa Cruz County. Founded in 1977, the DRSC acts as a food bank, translation center and advice broker for hundreds of low-income families across the area. In 2007, while studying English at Cabrillo College, Ambrosio worked at the Community Information Center for Migrant Assistance (CIMA). The organization, formed by members of four Santa Cruz and Watsonville-based churches, held weekend workshops to teach immigrant families the ropes of American life — how to fill out DMV forms, buy groceries and ace job interviews. Ambrosio said working for CIMA taught him about the close personal bonds that often form between volunteers and the people they serve. In the upcoming weeks, Ambrosio, along with UCSC students Valery Mendoza-Martinez and Karla Reyes, are hosting a series of workshops geared toward immigrant mothers about the intricacies of raising children in California. Ambrosio held the first workshop at Casa Latina on Saturday. The next three will be held Saturday mornings at the DRSC. Ambrosio holds office hours at Casa Latina every Friday from 9 a.m. to 12 p.m.